CONDITIONS OF SALE: This painting has to be taken down from public display every year between 6 and 9 August. STORY: Visitors to Japan are not so much surprised at how much that society has been Westernized, but how much it is Americanized. Everything, from the sports they play to the style of pizza they eat. One gets the impression that Japan has been truly colonized by Americans, which is not far from the truth considering that Americans have their troops in Japan more or less continuously since 1853. In this light, the American-Japanese conflict during the Second World War may be seen as a crashed independence struggle rather than an act of Japanese aggression. 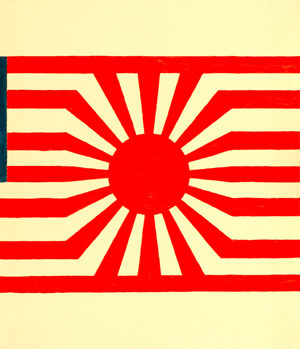 This painting shows the Rising Sun Flag absorbed by the stripes of the American flag, its 16 radiating rays forever trapped. The Imperial Japanese Army first adopted the Rising Sun Flag in 1870. When Japan was defeated in 1945 and the Imperial Army and Navy were dissolved, the flag fell into disuse. However, with the re-establishment of a Self-Defense Force the flag was re-adopted in 1954. The flag with 16 rays is today the ensign of the Maritime Self-Defense Force while the Ground Self-Defense Force uses an 8-ray version. The price range of this painting is an estimated number of victims of the Hiroshima and Nagasaki atomic bombings, which happened on 6 and 9 August 1945 respectively. Additional (white) surface below and above the merged flags is a symbol of hope for peaceful coexistence without colonial humiliation.